The Senate vote on the identical pension reform provisions as in the House bill described above. Curtis Hertel amendment to require charter schools to contribute to the cost of paying down the school pension system's $29.1 billion in unfunded liabilities, even though their employees do not get benefits from the system. The amendment was supported by all Democrats and by Republicans Emmons, Rocca and Schmidt. To make it a crime subject to 15 years in prison to perform a clitoridectomy, infibulation, or other female genital mutilation on person less than age 18. Claims that the procedure is required by custom or ritual would be explicitly excluded as a defense to prosecution. Related bills would ban transporting a girl for this purpose, authorize lawsuits from victims, and permanently revoke the license of a medical professional convicted of this. To allow the vehicle registration document motorists are required to have when driving to be an electronic picture of the document on their smartphone or other device. To repeal a ban on leaving an unattended vehicle running other than on a public street or highway. This would allow warming up the car in the driveway in winter. 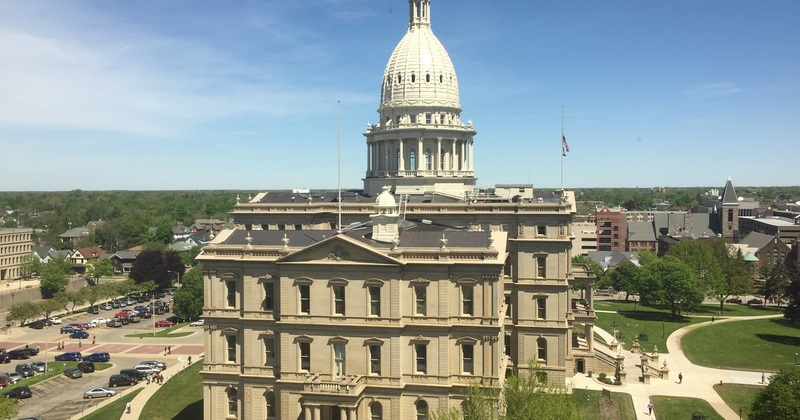 To create a state commission to recommend changes to trial court funding in light of a Michigan Supreme Court ruling that questioned charging defendants for costs that are unrelated to their case and instead cover routine court and municipal operations. The Senate also passed House Bill 4612 to extend the current (possibly excessive) levies another three years. To require public schools to include instruction on prescription opioid abuse in required health classes. House Bill 4406 requires a state commission to develop a lesson plan. To include acute treatment services and clinical stabilization services for opioid addiction among the medical services the state has assumed a duty to provide through its social welfare system, including Medicaid.